You are here: Home / Jewelry / Rings / Cathy Waterman gold, diamond and amethyst winged ring. 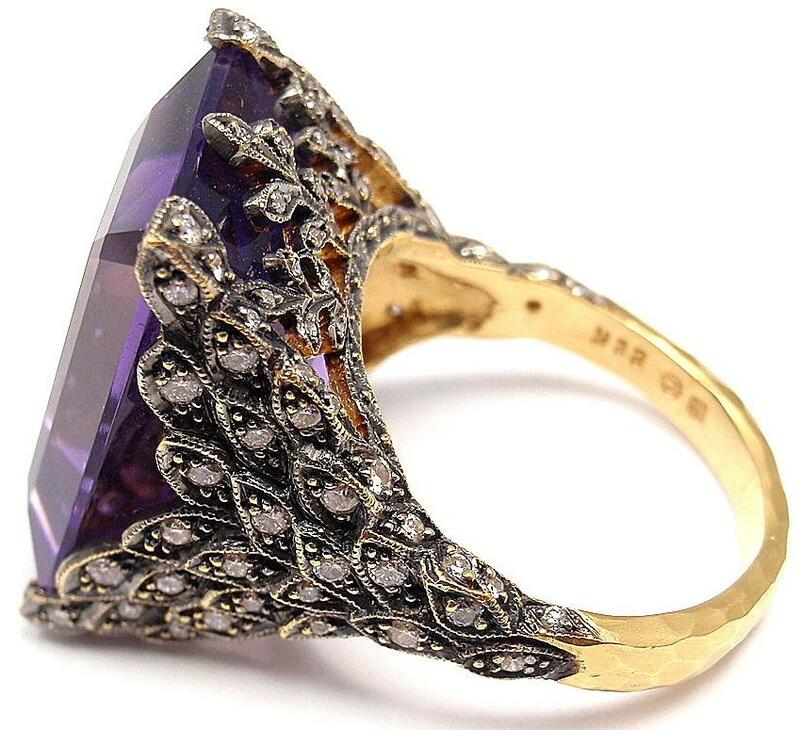 Cathy Waterman gold, diamond and amethyst winged ring. Warning: sit down before looking at this ring. It’s a knee-weakener. We’ve talked about Cathy Waterman before – this is one of hers. To be specific, it comes from the Cathy Waterman “Love of my Life” collection, although this particular piece is no longer produced or sold in stores. The setting is 22 karat gold, embellished with 106 round brilliant cut diamonds making up a total diamond weight of 1.50 carats. The amethyst, 21mm x 15mm, weighs 24 carats. This ring bigger and bolder than what I generally expect from Waterman, but the embellishment on the stetting, especially on the sides, shows the delicate, organic detail that makes me think of her work. This ring is for sale at Fortrove, listing available via 1stdibs. Thanks to Fortrove and 1stdibs for the images and info.